The primary source of light for more than a billion people in developing nations is also churning out black carbon at levels previously overlooked in greenhouse gas estimates, according to a new study led by researchers at UC Berkeley and the University of Illinois. Results from field and lab tests found that 7 to 9 percent of the kerosene in wick lamps — used for light in 250-300 million households without electricity — is converted to black carbon when burned. In comparison, only half of 1 percent of the emissions from burning wood is converted to black carbon. Factoring in the new study results leads to a twentyfold increase in estimates of black carbon emissions from kerosene-fueled lighting. The previous estimates come from established databases used by the Intergovernmental Panel on Climate Change and others. One kilogram of black carbon, a byproduct of incomplete combustion and an important greenhouse gas, produces as much warming in a month as 700 kilograms of carbon dioxide does over 100 years, the authors said. The findings, published online this month in the journal Environmental Science & Technology, are coming out at the same time that the United Nations Climate Change Conference kicks off in Doha, Qatar. While officials from around the world are seeking effective policies and guidelines for cutting greenhouse gas emissions, the study authors note that the simple act of replacing kerosene lamps could pack a wallop toward that effort. Smith pointed to lanterns with light-emitting diodes that can be powered by solar cells or even advanced cookstoves that generate electricity from the heat produced. Such technology, said Smith, is already available in developing countries. 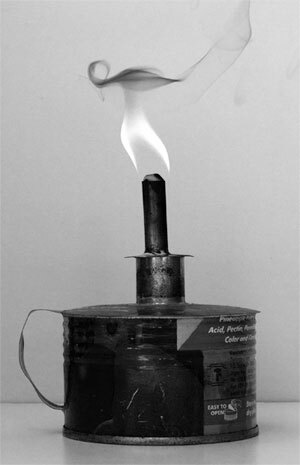 The researchers used kerosene lamps purchased in Uganda and Peru and conducted field experiments there to measure the emissions. They repeated the tests in the lab using wicks of varying heights and materials, and kerosene purchased in the United States as well as in Uganda. The study authors noted that converting to cleaner light sources would not only benefit the planet, it would help improve people’s health. A recent epidemiological study in Nepal led by Smith and other researchers at UC Berkeley’s School of Public Health, for example, found that women who reported use of kerosene lamps in the home had 9.4 times the rate of tuberculosis compared with those who did not use such lamps. “Getting rid of kerosene lamps may seem like a small, inconsequential step to take, but when considering the collective impact of hundreds of millions of households, it’s a simple move that affects the planet,” said study lead author Nicholas Lam, a UC Berkeley graduate student in environmental health sciences. The Centers for Disease Control and Prevention, National Institute of Environmental Health Sciences, U.S. Agency for International Development and Environmental Protection Agency helped support this research.